What is the minimum specification for a desktop computer to suit your needs? 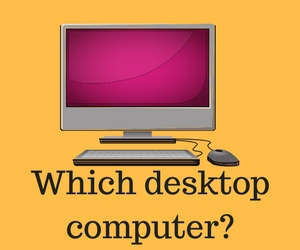 Copy the results and see which desktop computer suits you. Expansion options available. Large Size. Ease of maintenance. Dependancy of stable mains power. Higher performance possible. Larger power consumption. Larger monitors than laptops possible. Not easy to transport. Can include auto focus and microphone. USB connectors. Some monitors have a web camera built in. For a group of computers use a single Network Attached Storage NAS device. USB drive 500 GB to 2000 GB. Sound For music, VOIP communications, video conferencing etc. Can be headphones, headset with microphone or speakers Audio connectors assumed on all computers. Some monitors have speakers built in. Networking Wired Ethernet, Wireless Ethernet Wifi G, Mobile 3G Ethernet suits connection to ADSL or cable Internet or business network. Wifi requires a broadband router that support Wifi. 3G may suit when other broadband type are unavailable. Wired Ethernet assumed on all computers. Wireless Ethernet G for house area. Mobile 3G for city wide coverage. Display New monitor or use existing monitor. Monitors with 1 watt standby are preferred. Wireless Ethernet requires a Wifi card on the computer, Wifi ability on the network uses a Wifi enabled router or wireless access point. The wifi network name and password is needed for a connection. Desktop form factor is often cheaper than all in one or media centre PC. Chromebook computers for light computing needs can be cheaper than desktops. Linux operating system (free) can be $200 AUD cheaper than Windows 10 Home Premium or Mac OS X.